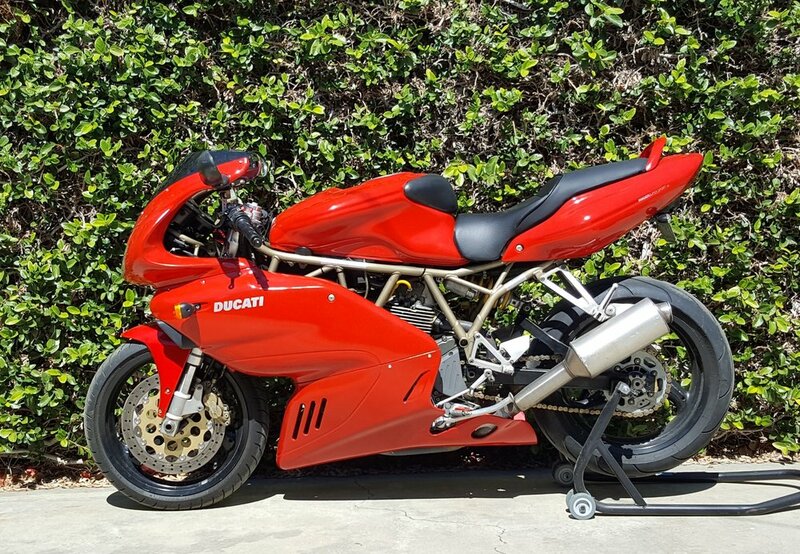 This 1999 Ducati 750 Supersport is in very good condition both cosmetically and mechanically. Mostly in stock condition with a plush Sargent seat, new tinted windscreen and shorty mufflers. All mechanicals are in good shape; engine, brakes, chain, tires, and lights (all work). The bodywork looks voluptuous in Ducati red. The Supersport models combine the best Ducati attributes of performance/handling with an ‘easy to ride’ experience. Especially with the reliable fuel injected 750 series engine, the combination of usable power (130 mph top speed) and good gas mileage (50 mpg) are a solid choice. The low miles (11K), fresh registration (Oct ’17) and great condition combine to make this 750SS a smart buy.